Correllation between Cyclomatic Complexity and Bugs density: Is this the real Issue? The first one is: Does CC strongly correlate with the duration of detecting and fixing defects? In other words, if CC is lower, would we spend less time debug and fix defects? The second one is: Does CC strongly correlate with the Fault Feedback Ratio (FFR, the average number of defects introduced while coding one change or fixing one defect)? It needs more investigation to see if anyone has ever studied this correlation empirically. But, my gut feeling and the feedback I get from the teams I work with is that there is strong positive correlation between cyclomatic complexity on one side and the duration of detecting and fixing defects or the change impact on another side. This is a good experiment to do. Keep alert for the results! Tomorrow, inshaAllah, I'm presenting at the RECOCAPE first gathering. I will be talking about the 'Process Increments' method, which me and my colleague Mohamed Amr have authored in 2010, and presented at the Agile Conference 2011. Now, this is a good opportunity to introduce this new concept about 'Process Increments'. A Process Increment is a process improvement chunk which can be implemented in a relatively small time (1-2 weeks) and still provide value for the organization. A Process Increment is independent from any other process increment, although it may have prerequisite ones. Furthermore, the process increments are estimated in points, and have very well defined 'Done' definition. They can even be written on index cards! Also, the whole project is planned in releases and iterations, and tracked using burn charts. In short, process increments is about running process improvement projects as typical agile projects. If you would like to read more about the results of the study, this is the link to the paper at the IEEE Xplore digital library. Also, you may download the paper for free at the Agile Alliance website. You may also download the presentation and watch me presenting it live at the Agile conference 2011 at Salt Lake City, Utah. Agile Solves Problems and Introduces Others! "Agile solves problems and introduces others!" 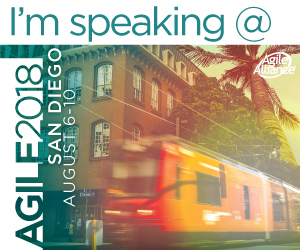 It was clear that he has a negative attitude towards "Agile"; may be he is talking about some bad failure patterns of Agile implementation, like those I mentioned in this blog item. However, I would affirm that the amount of problems that Agile solves are far way bigger than the ones introduced.